History will not be rewritten – at least not this year – in the Singapore Gold Cup after trainer Cliff Brown and connections decided that Debt Collector would give the marquee race a miss this Sunday. The 2016 Singapore Horse of the Year had already tucked away the first two Legs of the Singapore Triple Crown series in his customary devastating last-to-first style, the Group 1 Raffles Cup (1600m) and Group 1 Queen Elizabeth II Cup (1800m). 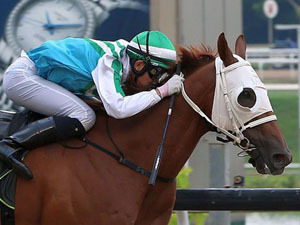 No horse had won the Triple Crown in the Singapore racing annals, regardless of format. Based on natural progression, most saw Debt Collector as a strong bidder for the clean sweep in the last Leg, the $1.35 million Group 1 Dester Singapore Gold Cup (2000m) this Sunday. But Brown was not quite on the same page about the son of Thorn Park. Not known as someone to throw caution to the wind, the Australian handler had actually more or less made up his mind shortly after the QEII Cup on October 21. He actually did the same thing with the champion galloper last year. After Debt Collector snagged the first two Legs (then the Panasonic Kranji Mile and Raffles Cup), Brown pulled the pin on the Gold Cup, then run over even longer, 2200m. The race was eventually won by the yard for the first time, as it went to a stablemate, the late Gilt Complex. “There is nothing wrong with the horse, he’s all good,” said Brown. “But he was never a certainty to run in the Gold Cup. He was at best 50/50. “As we all know, he lost his way last year, and then went back to Australia and came back in better form than he has ever been. “My main issue is the Gold Cup being such a tough 2000m handicap race where he will be giving weight to very good horses down the bottom. “Don’t get me wrong, we would have loved to have a shot, but bottom line is, I didn’t want him to end up back where he was again. We didn’t need that – his well-being matters more. “Of course, I discussed with the owner, Glenn (Whittenbury), who has always stood by me in whatever decisions I make. “The horse has done a wonderful job, he’ll go home and come back. There will be other opportunities for him down the line. Revamped as the new race to fill the gap left by the discontinued (in 2015) Singapore Airlines International Cup, the $3 million Group 1 Kranji Mile (1600m) was launched in May this year, and was open to international runners. The same formula will be maintained next year. No doubt, fans of Debt Collector and history buffs alike will be disappointed, but Brown’s fans can still root for another runner in the Gold Cup - Elite Excalibur. The Fastnet Rock’s six-year-old’s form may have tapered off since his last win in the Group 3 Committee’s Prize (1600m) in March, but he ran third to stablemate Gilt Complex in last year’s Gold Cup renewal and will stay all day. Brown has also thrown two new elements into the equation – headgear and rider. Winkers will be dropped for blinkers, and with Debt Collector a non-runner, jockey Michael Rodd – his partner at all his three Kranji wins - hops back on. “Elite Excalibur will wear blinkers this time. He’s going really good, I was very happy with his gallop this morning,” he said. Brown had actually entered French staying import Dicton as well, but the English-bred Lawman five-year-old did not make the cut, and will instead run in the consolation stakes, the $80,000 Kranji Stakes C race over 2000m. Rodd will ride. Just in case Dicton (was on 50kgs) got in, Brown had booked Melbourne lightweight jockey Ben Thompson for the job. The 21-year-old rider will now be left without a ride in the Gold Cup, but Brown had a contingency plan. “Ben Thompson was supposed to ride Dicton if he made it, but he didn’t. It’s okay as I also had lightweight rides for him in the other two big races on Friday,” said Brown. Brown could not be happier with his formidable pair of Zac Kasa (to be ridden by Glen Boss) and Mister Yeoh going into Friday’s $500,000 Group 2 EW Barker Trophy (1400m), while he is aware Mo Almighty faces an uphill task against another redoubtable duo in the $200,000 Group 3 Saas Fee Stakes (1200m). “I’m pleased with both Zac Kasa and Mister Yeoh. They both galloped on Monday, it was a good hit-out,” said Brown.